Kiwi is another name of New Zealand. Found nowhere else in the world, this small flightless, nocturnal bird is New Zealand's national symbol. Its uniqueness makes it appear everywhere in New Zealand, including its postage stamps. 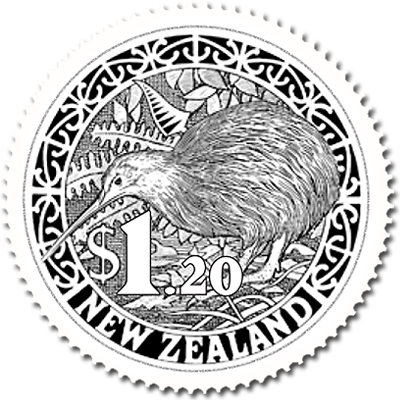 The famous round kiwi stamps of 33mm diameter were issued in 1988 (as seen below) and became an instant hit all over the country. This stamp was initially produced in a green colour, in booklets of six stamps; later printings in sheet format were in red, blue and purple. The first three printings of this stamp were by Leigh-Mardon by intaglio with the red and blue printings in sheets of 24 stamps. The purple printing was produced by Southern Colour Print by lithography in sheets of 36 stamps. The stamp was engraved by G T Prosser of the British American Banknote Inc. Canada from a design completed by Allan Mitchell. The round stamps were issued in many denominations thereafter on a number of occasions. To celebrate the passing over from one millennium to the next, New Zealand Post issued a 1999 Last Sunset cover, featuring a round Kiwi stamp with a gold sun overprinted in the selvedge. What made this feature particularly interesting for collectors was that the round purple Kiwi stamp was no longer available for sale, and only a small quantity of these stamps has been overprinted to mark this occasion. In March 2000, the round gold colour kiwi stamp of $1 denomination was issued in the sheet form. 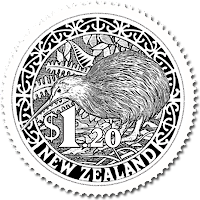 Now after 23 years of its first appearance and almost 11 years after the last print, the New Zealand postal authorities have decided to bring back the round kiwis once again on huge public demands as these stamps have almost been drilled into the life of ordinary New Zealander. A mint strip of three gummed round kiwi stamps brings delight to the ordinary people and stamp lovers and philatelists all over the world. The stamps come in three colours and three different denominations. The black stamps values $1.20, the grey one is priced $1.90 and the blue round stamps is priced at $2.40. So good luck to the New Zealanders for embracing the round kiwi stamps once again and for philatelists to add to their existing collection of older round kiwi stamps issued between 1988-2000.